You are coming from Colombia, listen to North American jazz and combine it with native music of your own blood and cultures of other nations. Who is the Snow Owl in his own words? Snow Owl is a symbol of the desperate need of all of us on this planet to have more cultural unity. You are coming to perform in Nové Mesto, Slovakia in quite a short time again. For what kind of performance and sound can we look forward? What is new, what remains the same? It was a pleasure to perform in the Blue Note last year and I am very excited to bring a FULL Band to present my new CD The Blue Road. You can expect an incredible journey through the human spirit. Tell us something about your fellows in the band – how many players, any singers, what nation of musicians, any special instruments... ? We are going to bring a “United Nations” of world-class artists to Slovakia. On Drums we have the Tupan legend of Bulgaria Stoyan Yankulov, our Ambassador from Serbia Nikola Stanosevic on Keyboards and another very talented musician from Bulgaria who is a pioneer on his instrument - Zhivko Vasilev. The Bulgarian traditional flute called Kaval has never been heard in a Jazz or World Jazz context before and this young man is fighting to shine a different light on this ethnic instrument. Alejandra María from Colombia on Violin will be joined by Viennese Harmonica Master Bertl Mayer and Brazilian Saxophone Player Marcio Tubino. 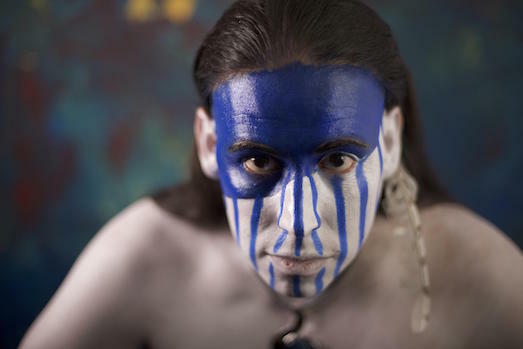 As a special guest we are happy to welcome Brazilian Percussionist Luis Ribeiro who will support and amplify this celebration of ethnic rhythms. Congratulations to your brand new Music Award! For what exactly it is? We received the Global Music Award for Instrumental Music. It’s always a great honour to be recognised by such important Awards. All this recognition and attention inspires me to continue to grow as an artist and show the world the best sides of us musical refugees. Say something more about your approach to music, your philosophy as a composer and musician. Has the blue color any special meaning to you? Music belongs to nobody. It is a gift from the universe that we must share and celebrate together. The meaning of “The Blue Road” is related to the believe of the indigenous people, who believe that a soul chooses one of three paths when they enter this world. One is the Blue Road, which represents for the spiritual path. The Red Road symbolises the physical and the Yellow Road is the balance between the two. “The Blue Road” is the first CD of this trilogy and will eventually be followed by the Red and Yellow Road. Why you did choose bass guitar and how did you come just to Contra Bass Guitar? What is the difference between standard 6-string bass and your instrument (in the way of playing or/and construction and sound)? The instrument chose me, because originally I wanted to be a piano player. My brother was studying drums at the time and he needed a bass player so he forced me into playing bass. I then discovered the Contrabass Guitar designed by Anthony Jackson and its sonic range was perfect for me to be able to be not just a limited-range-musician, but represent the entire bass clef of an orchestra! Thank you so much Martin, we really look forward to bringing an unbelievable musical experience to our fans in Nove Mesto! 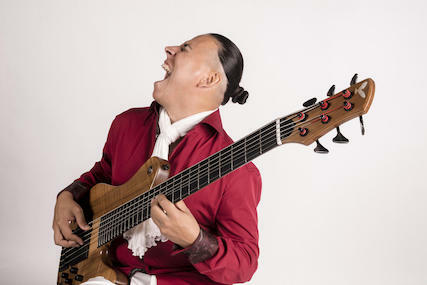 is a GRAMMY nominated Colombian born world-renowned electric bassist. - including several Grammy / Oscar award winners and nominees. Road”, accompanied by an ensemble of international worldclass musicians.